Quick, more money for SPORT —forget South Dunedin !!!! A three-month pipe renewal under Dunedin’s most prominent sports ground will help ease the pressure on the city’s wastewater network. Dunedin City Council contractors South Road have been working since late November to remove an old earthenware and cast iron sewer pipe, built in 1927, at Logan Park. Would have thought that South Dunedin would have been more of a priority . I suppose it is better not to upset the sports people. South Dunners can wait. That’s how we roll at #DUD…. if, we’re DCC. Glad to see you are into this, Elizabeth, I read that ODT article and immediately thought, ‘Here’s trouble brewing,’ Because historically, local authorities wouldn’t allow building on ‘ephemeral lakes’ or natural ponds associated with creeks. The word ‘watercourse’ is misleading because it actually means ‘creeks’ which are small rivers or, at least, an intrinsic and indispensable part of a river system. River systems really are a case of looking after the pennies and the pounds will look after themselves but the ORC doesn’t know this – because it totally focussed on such things as fairly cutting up the cake which is the Mighty Clutha. But the term ‘watercourse’ is useful for remembering that many of these creeks have been put in pipes and are now buried and have roads or buildings over the top of them and sometimes the location or even the existence of these ‘piped watercourses’ is unknown. Now one rule about piping a watercourse is this: THE PIPE IS ALWAYS THE WRONG SIZE. This is part of the MURPHY’S LAW OF PIPED WATER. Which is, as usual, if anything can go wrong, it will, with the additional warning that water moving creates highly complex systems which means there is far, far more to go wrong than you would expect; it will be really hard to fix and if you try to patch it in one place, you will almost certainly be breaking it in another place because WATER CANNOT BE COMPRESSED! So all around the world, cities are literally under pressure because of the CUMULATIVE EFFECTS of their historical water infrastructure construction. The way to remedy the situation is TO RELIEVE THE PRESSURE ON THE SYSTEM. This is most effectively done at the lowest points since water runs downhill and sensible people work with Nature because if you try to work against her you always lose. So natural ponding areas, like Logan Park, the Nairn St Park, Bishops Court, should be allowed to pond. They are flood buffers in river systems. They change in magnitude over time – they may be ‘ephemeral lakes’ but they are STILL lakes and should not be interfered with. But instead, local authorities who have recognised at least in the past that ephemeral lakes are not a good place to build houses, have used these open spaces for sports fields. But when they then try to ‘improve the sports field’, they damage the lake. So you get fast running water instead of still ponded water. And fast running water has tremendous force. Eventually it will always destroy its own pipe. And most of the time, within a system, there is as much or more water running OUTSIDE AND AROUND the pipe as there is flowing in the inside. 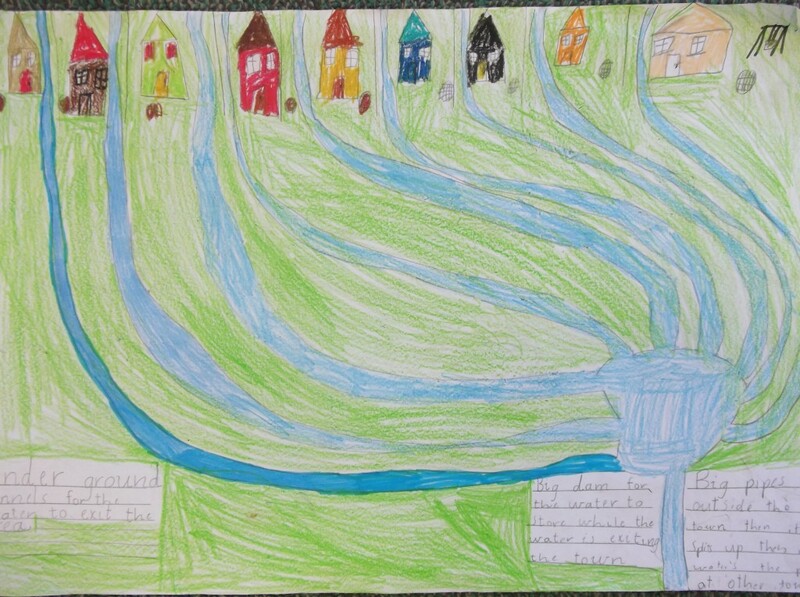 Of course, as one commenter noted in response to an earlier post of mine about water systems, a great deal of Mosgiel is built on a flood plain and would have worked like the Nile river in ancient times – an alluvial flood plain. Talk about food security and community resilience, here in Mosgiel is the breadbasket of Dunedin, even of Otago, and completely CONTRARY to the ‘matters of national importance in the Resource Management Act to preserve high class soils for food production, a [then] Deputy Mayor of Dunedin is allowed to make considerable personal profit by subdividing such land into suburbia. Wonder how that happened…. I might have digressed a long way from Logan Park. But the underlying principle is the same. Greed over private parcels of land. The idea that the landowner’s interests stop at his legal boundary and that he can maximise his interests, benefits and wealth within that boundary without any effect on anyone else. Or as the RMA cunningly puts it, where the effects will be of less than major significance (or some such weasel words or expression). Long term effects? Cumulative effects? Systems effects? Long distance effects in a moving water system? Lawyers can talk their way out of all of these. Which means the RMA protects nothing but lawyers’ and planning professionals’ bank balances. Diane. Interesting your remark about Mosgiel and the Deputy Mayor. The Independent Commissioner who was appointed to that particular resource consent turned it down. This resource consent with the public excluded was overturned by Council with the support of the very person who appointed the Independent Commissioner. It should also be noted that the Independent Commissioner had sat on several council resource consents prior to that, and has never had another council appointment since. Sally: we council watchers have long memories. And the way local government law works in New Zealand it is virtually impossible to do anything, legal or illegal, without some sort of record of it being made and kept. So when you see former public figures suddenly leaving the country, you know that they know the game is up. just to clarify this. The Deputy Mayor at the time was Syd Brown and no reference is being made to present Deputy Mayor, Chris Staynes. Sally: further comment on your comment, I will look up a meeting of a council committee which made a decision on this matter. I remember that Cr Bezett chaired the committee, used his casting vote to further the proposition, Cr Brown stood down from the table, Cr Stevenson was present and voted against it, CEO Jim Harland was present and sitting right next to Chair, Cr Bezett and at least one, maybe two Committee members were not present. The vote may have been about roading and the committee may have been Infrastructure Services. but it’s easy enough to find out. Peter Chin was mayor at the time. I can’t remember if he got re-elected or not. but it’s only either 3 or 6 years. Actually I didn’t mean to imply that anyone present at the meeting I referred to were crooks. In fact, I’m not sure whether there were any dishonest people nor any incompetents. Just that the outcome seemed very far from what a reasonable person would suppose the writers of the Resource Management Act intended. Dunedin doesn’t have ephemeral lakes and Logan Park isn’t one of them. Because it was a swamp doesn’t mean that it must revert to how it was. Also the way that a place responds to heavy rain depends on the current situation, not on what it was like in 1927. Every flat bit of land will flood if you dump enough water on it to allow the water table to rise high enough. What is the problem with putting creeks into pipes? Open watercourses can be a nuisance in a city. Anyway, the DCC is talking about sewerage (and wants readers to think that their work will have a by-product of doing something significant to improve the stormwater system, which seems unlikely). Water in a pipe doesn’t seem very complex to me. Problems with the old pipes will be fixed by replacing them with new pipes. Water in our stormwater and sewerage systems isn’t compressed, mostly they leak so badly that the ground-water leaks into the pipes. The only pressure should be on councillors to understand why there is a $60 million backlog of water works and for them to realize that they are to blame for it. The severity of the South Dunedin flooding was because of the incompetence of our mayors and councillors over the last decade. As I said, there are no ephemeral lakes and the swamps that existed here and there have been irrevocably destroyed, which is for the general benefit of the City. If there is any fast running water it will be inside a pipe and of no threat to you or me. We work against “Nature” all the time and we nearly always win. We do this to make the world a better place. It looks like you overestimate the usefulness of “high quality soils” and underestimate the effectiveness of the RMA. You and me both need to learn more about Hydrogeology (see wikipedia). Jimmy Jones: agree I have no expertise in hydrology. But Dunedin is fortunate in having local hydrologist, Dave Stewart. Also Dr Simon MacMillan of Kaikorai Valley College who is an expert on the Kaikorai Stream and has done some computer modelling of its catchement with Sam Mann of Otago Polytech. Regarding the RMA, I wonder what a philosopher of law would think about a law which was not prescriptive and did not give the people who are expected to obey it any certainty as to its precise meaning. IMO this is not a law at all because the very nature of law by definition is to be prescriptuve. The RMA is based on negotiation and on a flawed asumption that adequate mitigation of adverse effects is always possible and effective. My thoughts exactly Tom and Elizabeth – that’s why I have put in an official request to DCC to enquire what has happened to the planned (2015-17) Surrey St Stormwater Diversion Scheme that seems to have disappeared out of the 2015/16 LTP. An Otago Peninsula resident [Lois Paterson] is worried her local beach could be destroyed by work needed to buttress a $2.8 million slip repair at Turnbull Bay. […] She was also worried about the impact it could have on the sea life and angry [DCC] had not kept her and neighbours fully informed about how the work would be carried out. City residents had to put up with six days a week of “trench warfare”. A Maori Hill resident is fed up with the incessant noise and dust caused by road works which have been going on outside his house for a year. Wales St resident Ross Beckingham (69) said City Care contractors working for the Dunedin City Council had been carrying out road works on his street and neighbouring Fairfax St for the past year. He accepted the work, which involved upgrading stormwater, foul sewer and roading infrastructure, was needed, but said the contractor and the council had shown no consideration to local residents. DCC ! Get the bloody job done. Get the f*** out of these people’s lives. Show them respect. DCC and Public able to access detailed information online to measure contractor performance against contract specifications. “…Fulton Hogan regional manager Grant Sime said the company was disappointed to have lost the contract, adding it had been unfairly maligned by the council over its performance maintaining the city’s mud-tanks, which was part of its overall contract. Time will tell whether Downer produces the goods and delivers an ‘upper’ for the ratepayers, or whether it will be more of the same old same old. Depends of course on contract supervision by DCC, which could be a bit of a problem. Interesting to see how DCC and FH are passing the hot potato back and forth, but it looks as though there will be more monitoring with Downer. An embarrassing blow for company founded in Dunedin to lose the work on its “home turf”. The amount of info on what’s scheduled where and when, available online to one and all, should provide much more “contract supervision” not only by DCC but by thousands of other eyes. Watchers will include people who care strongly about their own patch of the city. No area will be safe from “citizen supervisors” eager to get their rates’ worth. Our ‘Great Leader’ is well and truly hung up on his ridiculous attempts to distance himself and council from any contamination over the June 2015 Sth Dunedin floods. A bit like the fabled ‘Brer Rabbit, Brer Fox and the Tar Baby story. I’m sure that the people of Sth Dunedin will see through it all and come October express their feelings on the ballot papers. The hope is Calvin, that Dunedinites generally will exercise votes in support of ousting said leader, in support of all the people at South Dunedin who have had to suffer his inane (skirted-)drivel on Climate Change and groundwater levels. Our leader, the basket case for dumping and total excision from City affairs (ie hasten to…..Tarras, for duckshooting). Hype! Are you ‘Daft’? Let the people in on the rackets, Never! Elizabeth, “Cull de Mayor” is not welcome at duckshooting in Tarras as he pissed off the landowners by subdividing against their wishes. He’s more likely to be the shootee than the shooter! Yusss. A thought underlying my trite.